Sesame noodles defined my childhood Chinese take-out Sunday nights. I never left the table without second helpings (or sometimes thirds.) My family became wary of our weekly tradition though after learning about the harmful effects of MSG, loaded salt, and saturated fat used in Chinese food cooking, and consequently substituted Sunday night take-out with more healthful alternatives. Therefore, I was delighted to get my hands on this healthy version of my beloved sesame noodles. 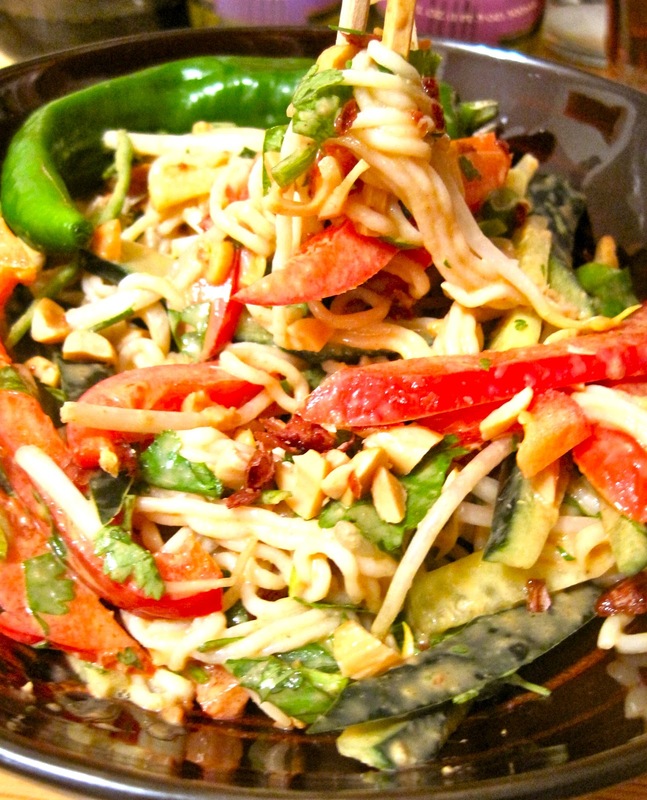 Serious Eat's Spicy Peanut Noodle Salad with Cucumbers, Red Peppers and Basil is the perfect makeover to a classic calorie-laden dish. Peanut butter provides the majority of calories in the salad, but they are derived from the LDL (bad) chloesterol-lowering "good fat". A heaping serving of julienned vegetables helps lighten up the calorie density while providing a nutrient boost, and whole wheat linguine or the fiber-rich, calorie-free Shirakati noodles (read more below) can be used to eliminate carb overload. Finally, preparing the dish yourself rids the mystery of any hidden additives, oils or salt that are potential in the restaurant-made counterpart. Another tip to maximum the health benefits of this dish: half the sauce and noodles while keeping the original quantity of veggies, and add a lean protein like grilled chicken to the mix. Sesame oil is the key ingredient in this dish if you want it to taste authentic; I would not recommended substituting anything else. I mostly stuck to the original recipe here, but I did use a bit less chili sauce (as mine was garlic-chili and I didn't want it to overpower), and used lime juice and rice vinegar as I enjoy both. A huge cilantro buff, I stuck to this herb but would highly recommend basil as well. 1. Cook noodles according to package directions. Drain and transfer to a large bowl of ice water. Agitate noodles until thoroughly chilled. Set aside while you make the dressing. 2. In a large bowl, combine peanut butter, soy sauce, chili sauce, lime juice, sesame seed oil, garlic, sugar or honey, and water. Whisk until homogeneous. Drain noodles thoroughly and add to bowl. 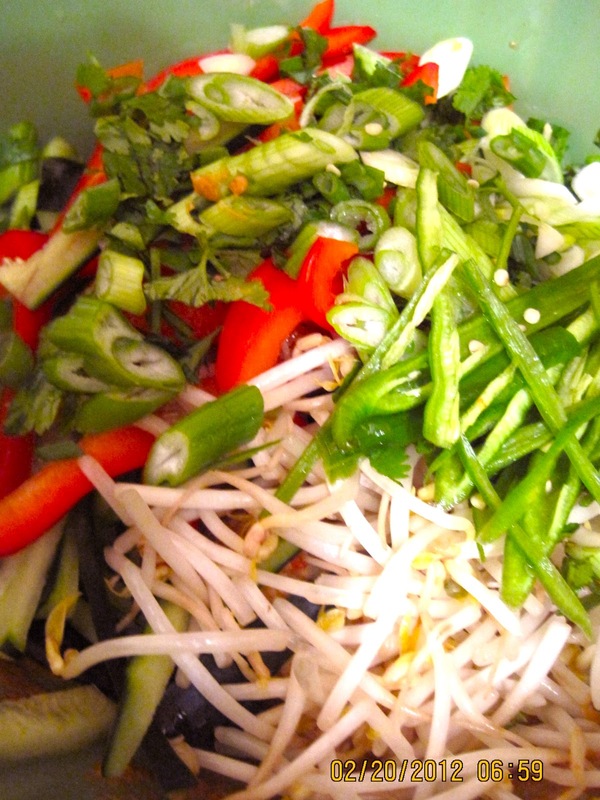 Add bell peppers, cucumber, bean sprouts, basil leaves, scallions, jalapeños, and bird chilis (if using). Toss to combine. Serve immediately, topped with roasted peanuts. Shirataki noodles are a Japanese noodle composed of a dietary fiber called glucomannan that is either extremely low-calorie or calorie-free. Similar to tofu, they do not have much taste on their own but easily absorb the sauce or dressing they are submerged in. Shirataki noodles are also called "yam noodles", as they are made from the flour of the yam-like Konjac plant. 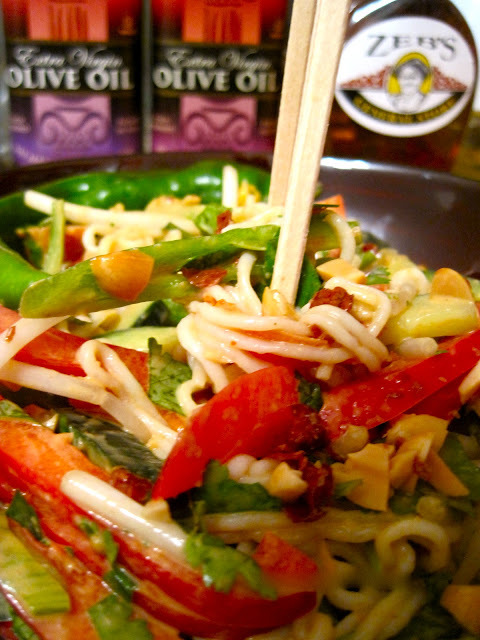 shirataki noodles consists of essential vitamins and nutrients,both the taste and health benefits of these noodles can be enhanced by preparing them with vegetables.Thanks for the awesome recipe.